2. Appearance – How does the altarpiece differ before and after in pictures ? 3. What was done in the process ? 4. What was learned that we did not know before ? An altarpiece is a framed artistic representation of a sacred subject or combination of subjects typically situated behind and above an altar. Canon Law LXXXII of 1604, the Church of England required "the Ten Commandments be set up on the East end of every Church and Chapel, where the people may best see and read the same, and other chosen sentences written upon the walls of the said Churches and Chapels, in places convenient." This affected colonial churches in Virginia such as St. Mary’s Lancaster, Aquia Stafford. Here is an article on other Virginia altarpieces. While only the 10 commandments were required by British law, it was common to include the Apostle’s Creed and Lord’s Prayer. 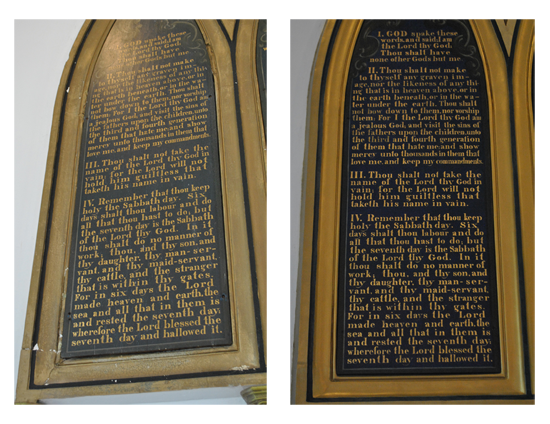 Also yellow letters on a black background was the predominant format as we have at St. Peter’s. There are still some colonial churches with the tablets intact and most have been restored over the years. This was true in the Colonial Period but St. Peter’s altarpiece was done in 1853, well after the period. Why now ? 2. Colonial revivalism was still a force in America as it entered the turbulent 1850’s. The idea of independence was a constant theme. The Greek columns, for instance, reflect Greece’s independence struggle in the 1820’s. 1. 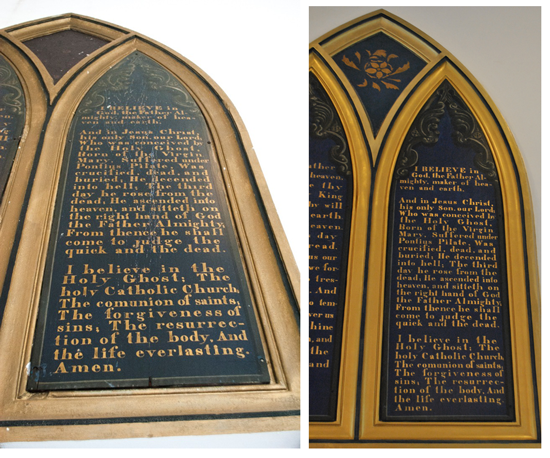 Wooden Tablets -Two pair of polychromed wooden panels inscribed with Biblical texts (The Lord ‘s Prayer, The Apostles Creed, and the Ten Commandments) are attached to the wall The four wooden panels have been affixed to the wall with large wooden nails driven through the sides and top of the panels. 2. Pinnacles – At the pinnacle of each pair or tablets is a small decorative panel painted directly on the plaster wall, which depicts floral scrollwork. 3. 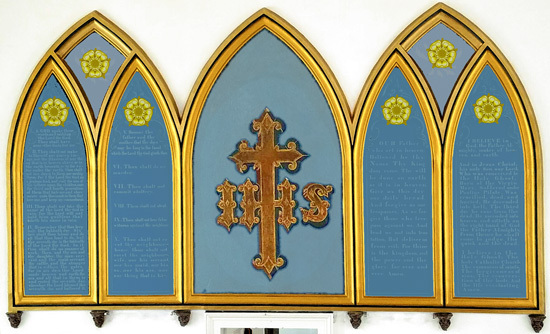 Center Section – The pairs of panels flank a central panel, also encompassed by gilt plaster gothic arches, which is painted directly on the plaster wall and depicts a Christian cross and the Christogram, I.H.S. 4. Framework – The Framework attached the wooden tablets to the wall. 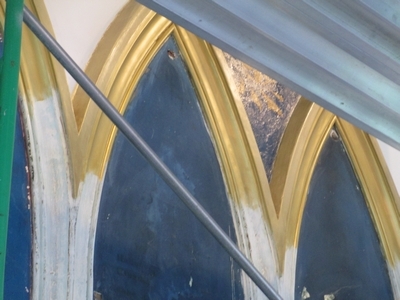 The plaster framework is gilt in a series of gothic arches. The plaster framework around the panels was probably cast separately and then attached to the wall. 5. 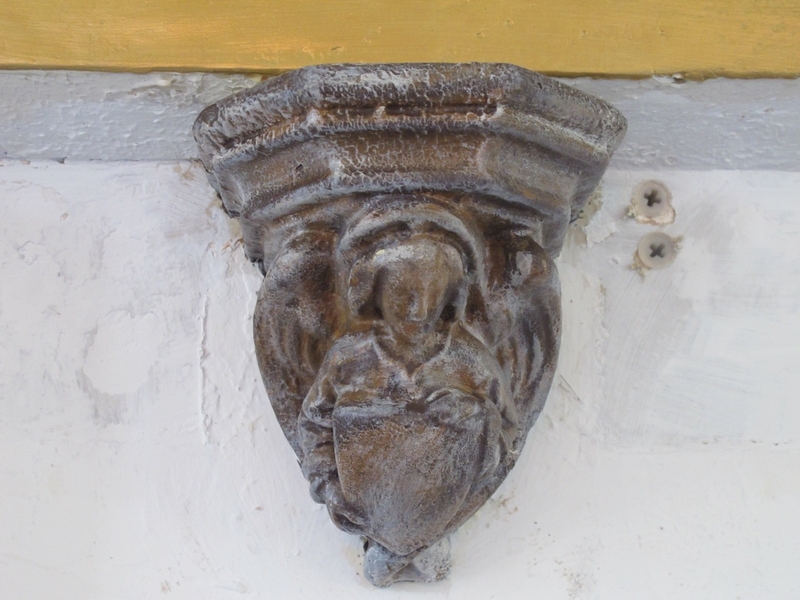 Angel Corbels -There are six plasterwork corbels along the lower edge of the altarpiece, each with an angel holding a shield on it. C. What were the problems ? Cleo Mullins our altarpiece conservator at St. Peter’s, Nov. 29, 2015 to explain the conservation process during the announcements and describe the problems she encountered in the various parts of the altarpiece. It is a case of the elements (earthquake water damage), time (framework gild, tablets bowing) and human mistakes (overpaint and damage to the framework by ladders). She opened the review to questions. The conservation is not an exact process since various details may be revealed in the conservation. "Recent damage due to earthquakes has caused fracturing in the lower left corner and upper left edges of the framework, where there are new cracks and chips. There are several areas of prior damage and loss to the molding with a large section missing from the inner edge of the left-most arch. Some areas of prior damage have been crudely repaired. The repaired areas have been painted over with a metallic paint. "..The moisture in the wall had caused the painted areas of plaster to flake and the wooden tablets to bow, crack, and lose paint along the wood grain. When the tablets were removed from the wall, each was stained and had large tidelines along the bottom — evidence of long term water damage. covered with a skim of pure white plaster." Cleaning – Clean to remove layers of overpaint with solvents. Consolidation -Any original flaking paint will be consolidated as cleaning progresses. Consolidation is the application or regeneration of binding material to improve the cohesion of loose media. Paint losses -Fill paint losses, cracks, and low areas a water soluble putty, and inpaint losses to match the surrounding extant paint. Repaint areas of the upper part of the central panel may need to be painted. Protective coating – After cleaning and consolidation are completed, apply a protective coating a crylic polymer to the painted surface. Consolidation -Any original flaking paint will be consolidated as cleaning progresses. Protective coating – After cleaning and consolidation are completed, apply a protective coating a Acryloid B-72 to the painted surface. Paint losses -Fill paint losses, cracks, and low areas a water soluble putty, and inpaint losses to match the surrounding extant paint. Repaint large areas of the upper part of the central panel. 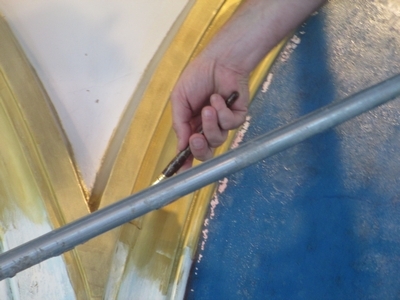 Gold scrollwork –The gold scrollwork decoration on the pinnacles will be restored by comparing the two panels and copying the corresponding elements. Missing areas of gold will be in painted with titanium coated mica gold-toned powders. There was previous flaking of the original surface of the pinnacles. This is especially true of the right panel, which shows extensive losses. There is a large crack extending through the lower edge of the frame and up into the painted panel. The 5 petal flower, above, was difficult to see (only in certain light) and the leaves were totally obscured. Structural stabilization/repair to any framework elements that are loose or otherwise unstable. Consolidation of all surfaces that are prone to further disintegration. Application of an appropriate isolating layer – to separate historic materials from new work. Cracks – Filling and other appropriate repair to cracks in framework. Losses, chips, dents, scrapes, gouges, and other damage to the molding profiles – filling and other appropriate compensation for these issues. Front and interior framework surfaces – Removal non-original paint layers. 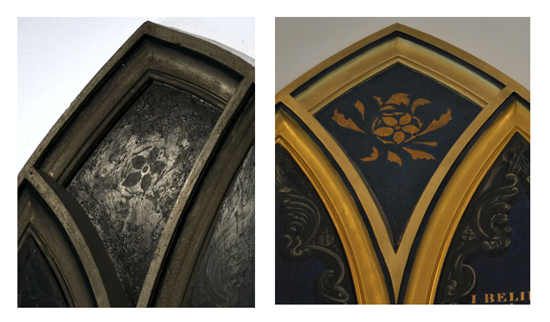 Application of a multi-layer painted finish that attempts to capture the spirit of the original gilded surface, including mica powder and various mediums at the conservator’s discretion. For all exterior framework surfaces, application of a painted surface that blends with the white wall. There are cracks, cupping and numerous losses in painted surface. Red and green paint was hastily and sloppily applied. 1. 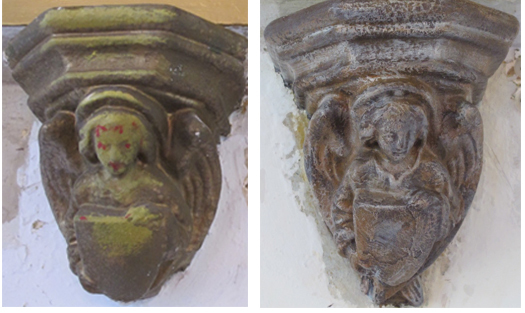 Reduction of inappropriate coatings and restoration materials from the surface of six angel brackets. 2. Minor restoration to chips and other damage to the figural castings Application of a similar painted surface, to blend with the plaster framework. 4 What was learned that we did not know before ? Cleo Mullins, our conservator, believes the altarpiece contains two phases of decoration. Accordingly this would make the altarpiece older than the 1853 date from Rev. Friend and diary accounts. They may have been writing ab0ut a second phase of decoration. "This consists of painted designs in bright yellow and cream colors, with perhaps touches of black, against a cerulean blue-colored background. The cerulean color was probably made with Prussian blue mixed with white. The Christogram and cross were most likely silver-leafed and coated with shellac in imitation of gold leafing. In the pinnacles, tiny traces of a paler robin’s egg blue were found and also drips of yellow paint.."
…"The decorative area of the altar wall were initially painted a robin’s egg blue color, which has become dark dull green perhaps due to age and having been glazed over with shellac. Traces of this color were found in all areas of the painted areas of plaster, including under the paper mock-ups for the tablets. I assume that this paint layer was applied soon after the church was built and was a temporary coating until the altarpiece could be constructed. "In 1849, the church suffered a fire, probably necessitating a second scheme of decoration. This scheme consisted of the current gold leaf lettering with foliate grisaille arches on the tablets over an ultramarine background. Stenciled metal leaf foliate decorations on an ultramarine background were added over multiple and severe paint losses on the pinnacles. "The central panel, however, seems to have survived, but the cross and Christogram were possibly enhanced with the yellow curlicues and washes of warm brown glaze at this time. It may have been painted around with a deep rose colored paint. Perhaps the red was added during subsequent restorations. The first part of the renovation involved removing the tablets on April 22, 2016. 1. Before the panels there was blue paper. It may have been made of linen. It is tearing and fragile and the lettering is smaller. From Cleo Mullins "The aqua-blue paint is very matte and is now quite soiled. The papers are torn and delaminating from the wall in several places and missing large pieces of the paper. The cerulean blue-colored paint was applied after the paper was already torn and the pieces missing. Where the paper has started to peel off the wall, the robin’s egg blue (once pale blue-gray, but now green) layer of paint that was initially applied to the plaster can clearly be seen. A.The panels may have been added when the paper began to crack. Or they could have been an improvement since the blue paper would have been more difficult to read. Or the blue paper was a cheaper first step ? B. From Cleo Mullins – "The paper mock-ups are significantly smaller that the niches that they occupy. Perhaps these were place holders for the final panels, an means of assessing the effectiveness of the design, and or a guide to placement of the final panels." 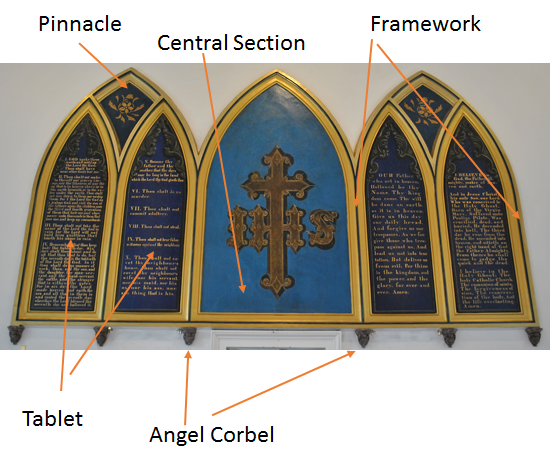 The blue recalls another use of blue was used in the center section which Cleo Mullins uncovered during early investigations into the altarpiece. The four wooden panels are cut from single planks of pine wood and are tall and narrow with a Gothic arch at the top. The panels were on the back of wood (pine) shipping panels. 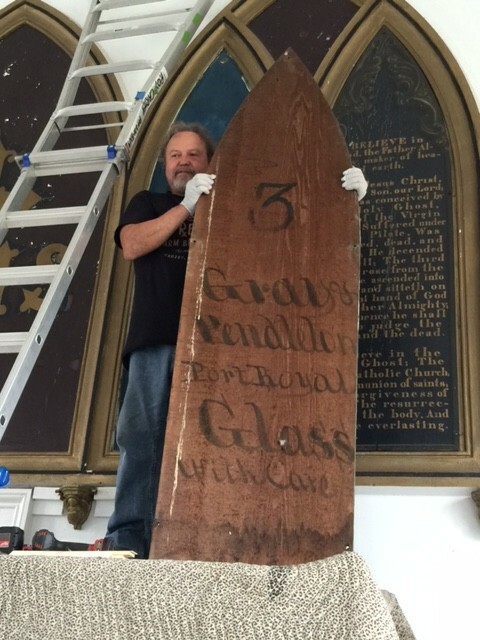 Inscriptions on the reverse of two of the panels "Gray and Pendleton Port Royal Glass with care" indicate that the pine boards were salvaged from packing materials from the firm of Gray and Pendleton, Port Royal. Thus it is probable the panels were local and not removed from another church. This may tell us the origin of the panels but not the artist. 3. There is water damage at the bottom. The panels also held some fragments of plaster that came apart when the tablets were removed. 4. Since two nails of different time periods were found, it is not surprising that the panels have been removed at another time. 5. Cleo Mullins – "The wooden pieces were inserted after the niches were repainted with the cerulean color." traction cracks in the shriveled ultramarine paint. The original lettering is only partial, indicating that perhaps the tablets were lightly sanded between the paint layers"
"..Of note — two of the panels originally had large, five-petalled York or Tudor roses at the top center, now partially covered by the grisaille scrollwork. These flowers were done in shades of bright yellow and cream, with perhaps some outlining in black or dark brown. These are found on The Nicene Creed tablet and on the second of the Ten Commandments tablets. This latter tablet was at first used for The Lord’s Prayer as e videnced by the fragments of lettering beneath the current ultramarine and gold leaf lettering, which reads, “Ou[r Fath]er / W[ho art in He]av – / en… [etc. ]” So these tablets were initially in positions 3 and 4 on the wall." 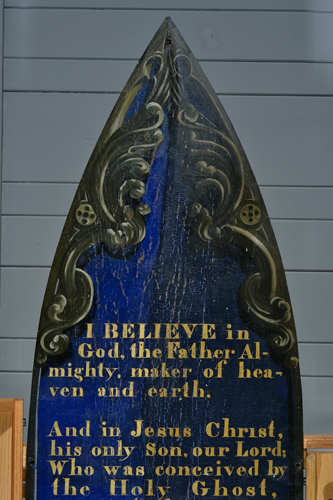 "Most of the current letters over the thinly painted ultramarine blue field are water gilding (gold leaf applied over a water soluble mordant) and unburnished. However some of the lettering is applied over a oil mordant. The edges of the panels are bordered with dark gray and separated from the blue field with a narrow lighter gray stripe and sometime black as a shadow line. Along the upper edges of the pointed top of the each panel there is painted Gothic scrollwork in imitation of verge boards, done in grisaille with putty and gray colored paints. of some of the surface, possibly after a subsequent fire or long term heating with coal burning furnace or stoves. 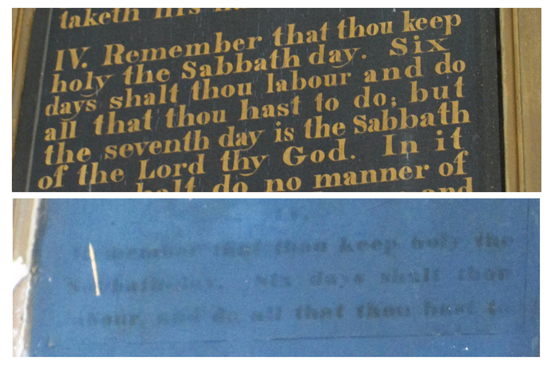 Some of the letters had been overpainted or retouched with metallic paint. 1. A crosslinked layer of damar-like varnish, probably with drying oil added. This layer has a very thin layer of airborne grime on it. 2. A substantial layer of black grime. 3. A very tough oil varnish, which is somewhat cloudy and a light dirty tan in color. 4. A blackened crusty layer of sooty grime. This could well be your fire damage as it is very difficult to remove it evenly from the blue paint beneath it." Soot is a byproduct of a fire. Possibly, that was left from the 1868 fire. Russell Bernabo, Aug. 13– "The original finish on the cast angels was a rusticated surface of mottled cream and brown tones, meant to suggest antique carved wood or stone, as similar carvings would have been in past centuries. Our new surface is very similar to the original finish and, coincidentally, a good choice to coordinate with thealtarpiece. 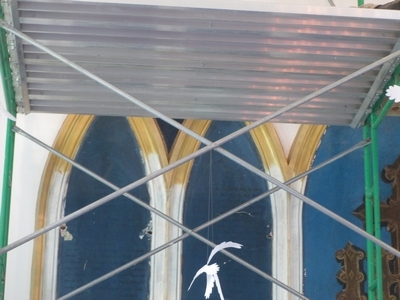 The angels appear to be architectural like brackets in old cathedrals and of similar age to the altarpiece, rather than /matching/ it, which really wouldn’t make sense. I noticed a nice dialogue between the angels and the hymn boards." July 10, 2016 -"Selected areas, especially the exterior sides that previously were painted with the same white paint as the wall, show a surface that is close to the final finish, but not yet complete. Those areas still get several more coats of coats of tinted varnish enhanced with pulverized mica to bring an appearance essentially identical to your small sample from last year." Rusty found that sections of the framework were originally delineated by dark blue striping, which was eventually covered with flat black paint. Rusty has restored the original dark blue. 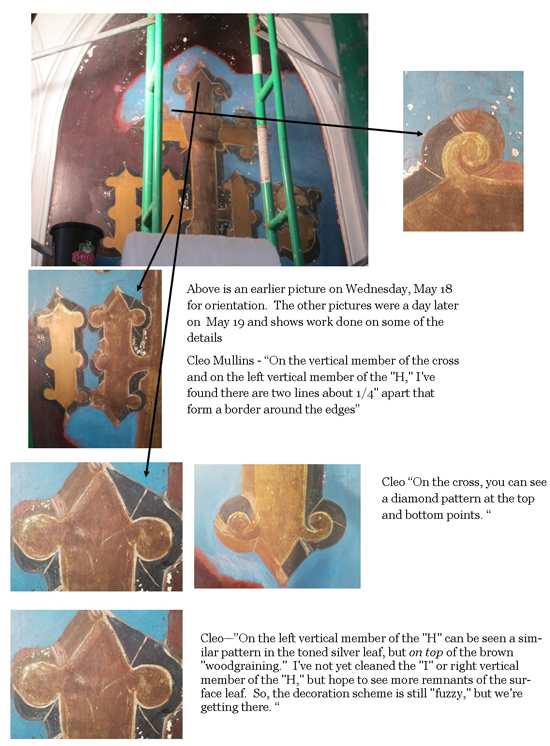 Cleo Mullins- May 20 "If you recall when we were testing the right pinnacle, we were finding the layer of blue that the "gold" stenciling sits upon was darker than the blue of the central panel and appeared to cover deep craters of lost paint. 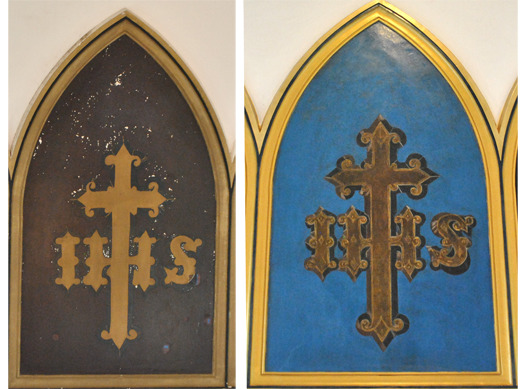 "In cleaning the central Christogram panel, we’ve found a similar blue color that is associated with an early restoration. On the pinnacles, Beth has found a paler blue under the darker blue that may be the remnants of the original paint layer, but there has been so much damage to both pinnacles that there appears to be little left that’s original. 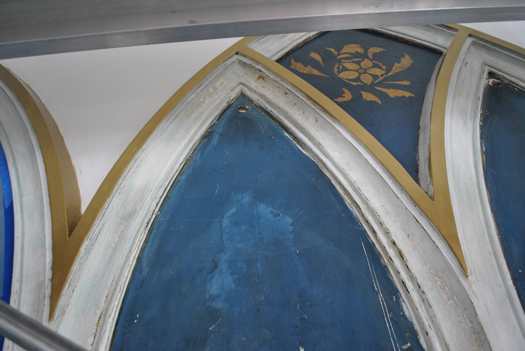 The gold decoration that we can see is all part of a restoration. It’s possible, though that the restoration copied an original design — as was done on the Christogram. Cleo Mullins-June 11 – "Beth also took a series of infra-red reflectance photographs and we can see a bit more of the design elements that are still hidden on both the pinnacles and central panel. She also traced what we’d been able to uncover of the pinnacle design. The floral design on the two pinnacles were made with a combination of five separate stencils and on each side, the stencils were placed a little differently, but still maintained the same design. "Most of the early Victorian stencils are very symmetrical, but this one is not. 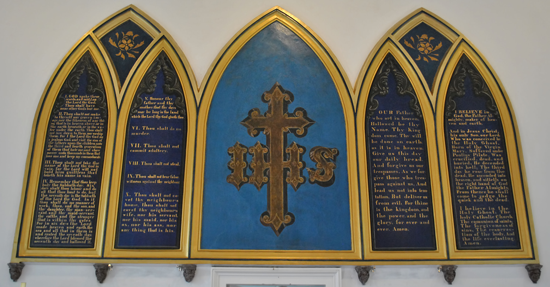 This suggests to me, as does the "primitive" quality of the lettering on the central panel, that a parishioner did the decorations and not a professional. "The field behind the gold leafed stenciling on the pinnacles is darker, more of an ultramarine blue than the cerulean blue of the central panel and is closer in color to the background that I’m finding on the wooden panels." Cleo Mullins May 20– “On the cross on the central panel I found a structure that consists of silver leaf with a pattern of fine yellow ochre lines on top and a transparent yellow coating. This is covered by a thin, translucent layer of brown paint that looks like it is intended to be faux-wood graining. You can see the gold and (faintly) the lines coming through the brown paint. It’s hard to say if the brown is original or not, but it has the same solubility (or lack of it) as does the rest of the lettering and the blue background. On the vertical member of the cross and on the left vertical member of the "H," I’ve found there are two lines about 1/4" apart that form a border aroud the edges. On the cross, your can see a diamond pattern at the top and bottom points. On the left vertical member of the "H" can be seen a similar pattern in the toned silver leaf, but on top of the brown "woodgraining." I’ve not yet cleaned the "I" or right vertical member of the "H," but hope to see more remnants of the surface leaf. Cleo Mullins, May 22 We have seen the cross as gold which was an actually a brass paint. The original was a darker shade of brown to make it look like wooden cross. The blue color above is the original color of the background rather than the dark brown as we have seen it. The slides show progress between work on Wed, May 18 and Thursday May 29. The Altarpiece had witnessed all events at St. Peter’s in the last 160 years – except its own restoration. Now, after 160 years, that omission has been rectified – the altarpiece is back as close as possible to the original look in the 1850’s that we can make in 2016. Time, human error, and weather have been corrected due to the skill of Cleo Mullins and the Richmond Conservation Studio.